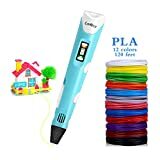 Whether or not you have a single artistic bone in your body, we guarantee that you will have an absolute blast with the Canbor 3D Printing Pen. This awesome contraption 3D prints the same type of plastic that a conventional 3D printer does. But instead of programming a printer with a design file, this 3D Pen lets you draw freehand! You can make all types of different creations with this great pen and we promise you’ll love every minute of it.